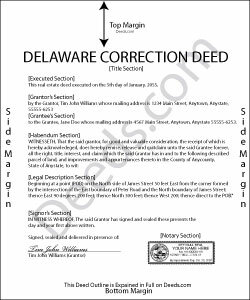 Use the correction deed to correct an error in a previously recorded deed of conveyance in Delaware. For certain changes, a correction deed may not be appropriate. Adding or removing a grantee, for example, or altering the manner in which title is held, or making material changes to the legal description, especially deleting a portion of the originally transferred property, may all require a new deed of conveyance, instead of a correction deed. When correcting the legal description, both grantor and grantee should sign the corrective instrument to avoid any doubt regarding the conveyed property.